Billy Mitchell, the current Donkey Kong World Record holder at 1,050,200 points will have his score challenged, at the Los Angeles Convention Center during E3. The man at the console is once again, Steve Wiebe, who originally took the world record from Tim Sczerby. 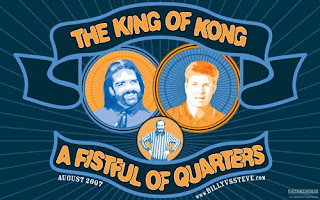 The takeover of the top slot drew Billy Mitchell's attention and the teeter-totter battle between Mitchell and Wiebe led to the release of the 2007 film The King of Kong: A Fistful of Quarters. The trailer says a lot about the movie, the absolute nightmare that the classic Donkey Kong game really is, and the rivalry that grew between Mitchell and Wiebe. Check out other scores, player rankings, gaming statistics, and championship tournaments at Twin Galaxies. The attempt to break the record will be broadcast on G4, today, live. Such a challenge and such a tournament! I am not into video games as I have a bad eye sight but people who can do things such as those two are really powerful and intelligent! Thanks for stopping by and your comments! Bless Steve, he failed on the first attempt, lost power to his Donkey Kong cabinet on the second attempt, and upon the third reached a "kill screen" ending the game around 60,000 points shy of beating the record. Never, during the entire affair did the man stop smiling, he's indomitable. During the second attempt, he did pull off what may be a DK first, by jumping two barrels simultaneously, and, in front of the amazed referees, gained the points for both barrels. We'll have to see if he ends up in the record books, just for that feat!